Although I’m not actually following the Weight Watchers ProPoints plan myself, I have heard some very positive things about it through friends and twitter, so I was interested to see what the cookbooks were like when I was asked to review them. I have to say I was very surprised at the range of recipes and inspired to get cooking and trying out some new recipes. 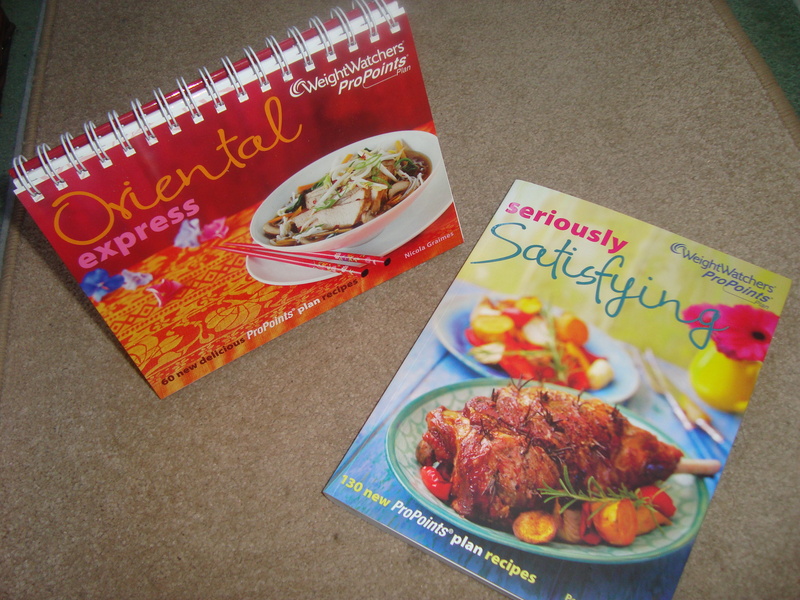 I was sent a copy of Oriental Express and Seriously Satisfying – both books that are geared towards those following the ProPoints plan but just as good as recipe books for those who aren’t. 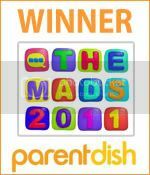 There were loads of recipes in each book that my family would enjoy, with the bonus that they are healthy balanced meals. As the name suggests, the Oriental Express Cookbook has recipes inspired by flavours from the Far East, such as Thai Turkey Sticks, Plum & Sweet Chilli Beef Kebabs and Singapore Pork. I also love the way this book has wipe clean pages and stands up by itself on the work surface, meaning you don’t constantly lose your page! Seriously Satisfying is packed full of recipe ideas for breakfasts, light lunches, soups, family meals, puddings and even a chapter on chocolate! The recipes in both books include all the details you’d want to know if you are following the ProPoints plan such as how many the dish serves, the ProPoints value per serving and the preparation and cooking time. There are also helpful hints about making the recipes healthier (e.g. substituting chicken mince for beef mince) or ideas of other ingredients to try (e.g. using sweet potatoes instead of regular potatoes) at the bottom of each recipe. 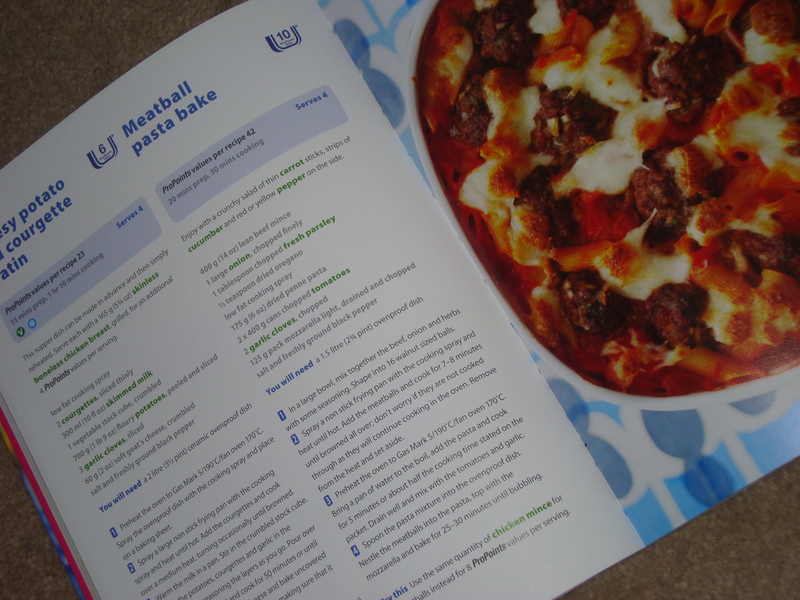 So, keen to try out some of the recipes for myself I flicked through the books and a recipe jumped out that I knew all the family would definitely go for – Meatball Pasta Bake. 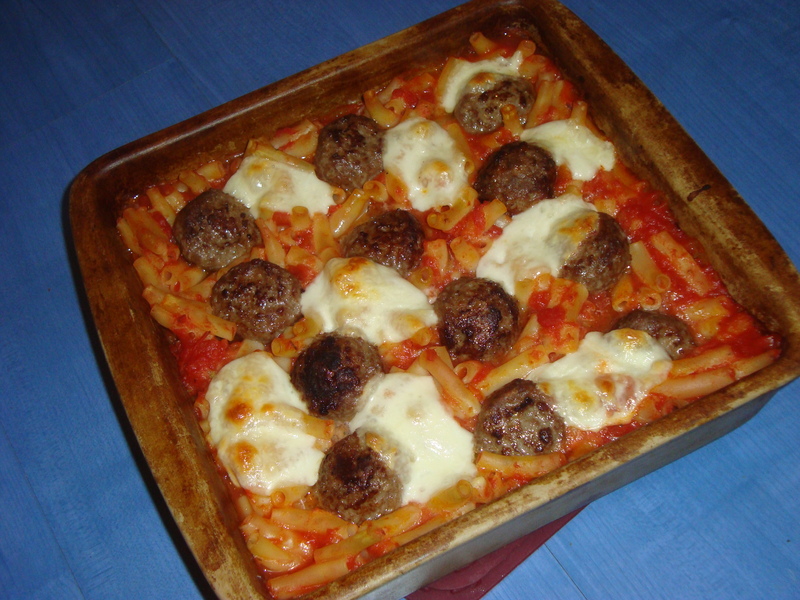 This is a hearty dish of pasta and meatballs in a tomato sauce baked in the oven with low fat mozzarella. It was really easy to prepare, fairly inexpensive to make and was a real hit with us. The recipe serves 4, took about 40 minutes to prepare and cook and is 10 ProPoints per serving. I served it with a large green salad and we really enjoyed it. This is a review post: I was sent free copies of the two books for review purposes.